The GS stands for graphics and sound, two areas where the IIGS stood head and shoulders ahead of the rest of the Apple II line – not to mention the black-and-white Macs of the day or the 16-color EGA that was becoming standard in the PC world. At 320 x 200 pixel resolution, the IIGS supported 16 colors from a palette of 4,096, not unlike EGA. What set the IIGS apart was that each scanline could have its own 16-color palette, so it was possible to display up to 3,200 (16 colors x 200 lines) colors on the display at once. A higher resolution 640 x 200 pixel mode was limited to 4 colors per line, 800 colors total. The IIGS was the first personal computer to use a fully digital synthesizer chip, the 8-bit Ensoniq 5503, which has its own memory and supports 32 channels and 15 separate stereo voices (the 16th is reserved for the operating system). Between the graphics and the sound, the IIGS was a great gaming platform. These features also put the IIGS in competition with the 1985 Amiga 1000, Commodore’s breakthrough computer for graphic and audio work. It has 320 x 200 and 320 x 400 graphic modes supporting 32, 64, or 4,096 colors, as well as 640 x 200 and 640 x 480 16-color modes. On the audio side, the Amiga had four 8-bit PCM channels operating at 28 KHz. The US$1,295 Amiga edged out the US$999 IIGS in graphics, but the IIGS beat it on the audio front. The Apple IIGS was the only model in the Apple II line to use a 16-bit processor. Instead of using the old 6502, it used the new 65c816 from Western Design Center, which is nearly 100% backward compatible with 6502 software – it can boot directly into older versions of Apple DOS, as well as use ProDOS, the new Apple operating system based on Apple III SOS. Instead of plodding along at 1 MHz, the new CPU runs at 2.8 MHz, and this was probably the most debated decision Apple made about the IIGS. The Mac Plus was Apple’s flagship computer with 1 MB of memory and an 8 MHz 68000 CPU, and Apple didn’t want people to perceive the IIGS as competing with Macintosh. The 68C816S design runs at up to 14 MHz, and by holding the CPU to 2.8 MHz, it was at least 80% less powerful than the Mac – and thus no competition at all. The IIGS shipped with 256 MB of system memory and can be expanded as far a 8 GB – twice as much as the Mac Plus. Apple introduced the Apple Desktop Bus (ADB) with the IIGS. 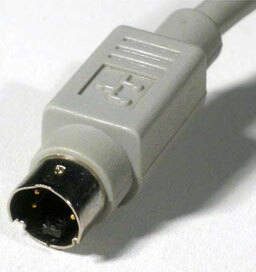 This port was used primarily for keyboard and mouse, but could also be used by a graphics tablet or a modem. ADB supports daisy-chaining devices, which is a good thing since the IIGS (and also some Mac PowerBooks) only have a single ADB port. The IIGS has seven expansion slots plus a memory expansion slot. Since it already had a floppy drive port, two serial ports, and ADB port, plus composite and RGB video ports, there was far less reason for users to add cards, although adding Apple’s High Speed SCSI Card and a SCSI hard drive was a good one. The IIGS continues the Snow White design language introduced with the Apple IIc, and it was the first Apple product available in Platinum, Apple’s name for a warm shade of grey. Macs would adopt Platinum and ADB starting in March 1987. Perhaps the most disappointing part of the IIGS design is that it did not include a built-in 3.5″ floppy drive. There was a limited edition of 50,000 Woz signature Apple IIGS computers produced for Apple’s 10th anniversary. Because the “signed” (really silk screened) cover could be moved to another IIGS, Woz editions are no more valuable than the regular IIGS. Believe it or not, there was even an Apple IIGS upgrade for the Apple IIe for US$500 – half the cost of the new computer. You got a new logic board and lower half of the computer case and a IIGS nameplate, but the end result still looked like an Apple IIe. Also, you needed an ADB mouse and keyboard to really take advantage of the new system, which boosted the cost significantly. When the Apple IIGS was discontinued in December 1992, only the Apple IIe remained as the last member of the Apple II family, which was phased out on November 15, 1993. The Apple IIGS shipped with ProDOS 16, and enhanced version of ProDOS 8. ProDOS 16 was mostly an 8-bit operating system, but it was modified for the IIGS hardware. It was replaced within a year by a true 16-bit operating system. In 1988, ProDOS 16 was replaced by GS/OS, which was specifically coded for 16-bit operation. ProDOS was very similar to Mac System 5 with a Finder, fonts, and device drivers. GS/OS would continue to be updated annually until version 6.0.1 was released in 1993. Would you believe that GS/OS 6.0.2 was released on July 15, 2015? It’s not from Apple, but it squashes a number of bugs that remained in version 6.0.1. If you’ve got a IIGS, be sure to check out the free download. If the IIGS intrigues you and you’d like to give it a virtual try, the KEGS Apple IIGS emulator is available. You will need to acquire a ROM image from a IIGS, and the emulator is available for Mac OS X, Win32, and most Unix/Linux computers. I worked for an Apple dealer during 1987, and one of the biggest problems we saw was that when Apple updated the ROMs, which required owners to bring in their computers to have the ROMs replaced, there were problems where the new ROMs would break existing software. Some customers actually wanted their old ROMs reinstalled until the software was fixed. The first ROMs used fairly buggy code, which some call “almost beta quality”. By late 1987, new software written for the IIGS would be incompatible with the original ROMs, and GS/OS 4 and higher were not compatible with them either. RAM Disks were limited to 4 MB with the original firmware, even if more RAM was installed. ROM Version 01 arrived in August 1987, nearly a year after the IIGS had been released. This included several bug fixes and updated system tools. Software developers immediately stopped coding for the original buggy ROMs. In March 1988, Apple began to ship the IIGS with an Apple IIGS Memory Expansion Card preinstalled, bringing RAM up to 512 MB – 256 MB on the system board and 256 MB on the card. ROM Version 3 came out two years later, in August 1989, when Apple updated the IIGS system board and shipped the IIGS with 1.125 MB of RAM. This ROM version was not available as an update, since it was specifically tied to the new motherboard. The 65C816 began as a 4 MHz chip but was available in 5 MHz and 14 MHz versions, so you know someone had to find a way to make the IIGS run faster than 2.8 MHz. Here are the accelerators I can find for the IIGS – all long since discontinued, of course. TransWarpGS lets you more than double performance of the Apple IIGS using a faster CPU and an 8 KB of cache memory. It has a control panel built into the card that lets you choose between 1 MHz, 2.8 MHz, and 7.0 MHz. Some have modified the TransWarpGS to run as high as 18.75 MHz. Applied Engineering also offered a 32 KB cache upgrade to further boost performance by an average of 22%. ZIP Technology offered three 8 MHz accelerators for the Apple IIGS: ZipChipGS (Model 1500), ZipChipGS Plus (Model 1525), and ZipGSX (Model 1600). The ZipChipGS shipped with 8 KB of cache memory, while the other two included 16 KB. Cache size can be boosted to 32 KB and 64 KB. You could also order the ZipGSX in 10 MHz and 12 MHz versions. One ZipGSX user shares online how he modified his to run stably at 12.5 MHz.